Dorchester teens, Van Nguyen and Tarell Longsworth, were chosen to speak at Youth Enrichment Services (YES)’s recent Black Diamond Gala fundraiser on April 5, 2018. 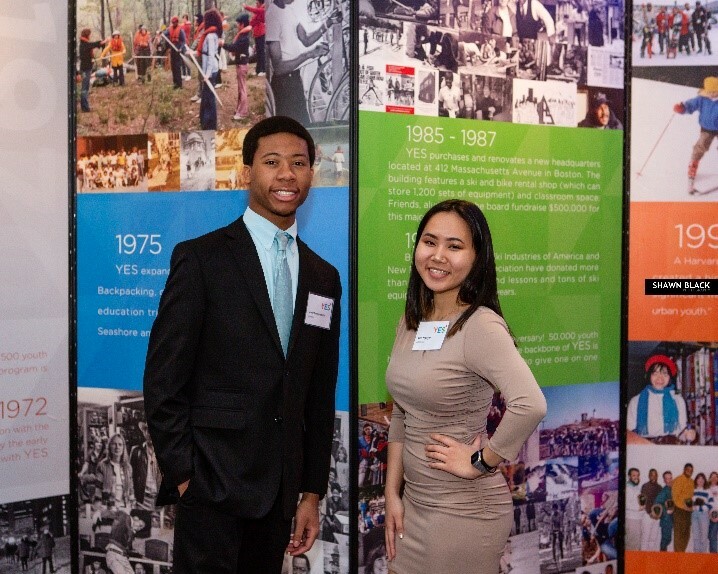 YES offers year-round outdoor and enrichment programs to Boston youth. This year, more than 552 Dorchester youth participated in YES programs. Both Van and Tarell will be attending college in the fall. Van plans to study Social Justice at Occidental College in Los Angeles while Tarell will be studying Business at UMass Dartmouth. The event attracted more than 350 supporters, including Olympic skier, Ryan Cochran-Siegle and Boston City Councilors, Annissa Essaibi George and Ed Flynn. Boston philanthropists and YES volunteers, Jason and Carolyn Soules, were honored with the 2018 YES Achievement Award. U.S. Ski Team athlete, Megan McJames, received the T2 Foundation Athlete of the Year Community Service Award. The event raised over $600,000 for Boston youth. Funds will support YES’s outdoor sports and leadership programs: Operation SnowSports, Outdoor Adventure, Leadership Corps, College Preparation, and Career Exploration programs. Top sponsors of the 8th Annual Black Diamond Gala included The Abrams Management Company, Adage Capital Management, Citi, The George Macomber Family, Leerink Partners, The Martin Richard Charitable Foundation, Morgan Stanley, Peabody Office Furniture, and RBC Capital Markets. The evening, which is YES’s biggest fundraising event of the year, was held at the Renaissance Waterfront Hotel in the Seaport. To view photos from the event, visit www.facebook. com/yeskidsboston.